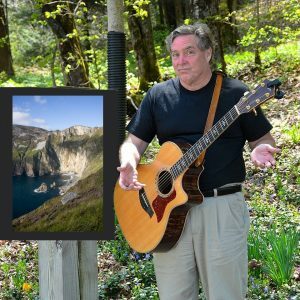 Irish Entertainer, Singer and Story Teller Extraordinaire! Full Irish Breakfast daily including the day of arrival. For all tour registrations please fill out the booking form found on the right hand side of this webpage please also click the number of members that you will be signing up for and that all information is correct before proceeding. To register for this tour and if paying by check please click on the PDF icon below and download & print this registration form. Full touring itinerary to be finalised, for more information please email info@bracktours.com and a member of the team will be in contact. 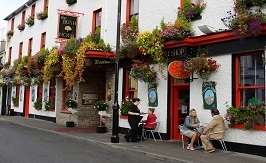 Charming award-winning heritage boutique hotel in the centre of Carrick on Shannon, County Leitrim. The Hotel, a member of ‘Original Irish Hotels’, is steeped in history, charm and character with many memorabilia from the past. One of Ireland’s finest hotels, the Bush started life as an Inn and resting point for tired travellers and their weary horses on the Bianconi Stage Coach route between Dublin and the Northwest. Today the tradition of Inn keeping continues and the Hotel has been sympathetically and sensitively restored. Located in the Diamond at the heart of Donegal Town, the Central offers varied dining, regular live entertainment and complimentary leisure facilities. Central Hotel Donegal as the name suggests, sits amid the town’s 21 bars and restaurants and is a short walk from the famous Donegal Bay Waterbus. The Central Hotel Donegal Town is an ideal base for guests to enjoy discovering the wonderful things that the Historic Donegal Town has to offer. 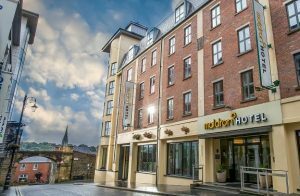 Ideally situated inside the Derry City Walls with recently refurbished rooms, bar, restaurant and gym the hotel is perfect for leisure and corporate travelers alike. In close proximity to some of the best pubs and restaurants it is the perfect base to explore the city of Derry and the surronding areas. This four star Belfast city hotel is perfectly located within the Linen Quarter of Belfast city centre, ideal for visiting the Titanic Exhibition, a night out at the Cathedral Quarter or shopping at Victoria Square. 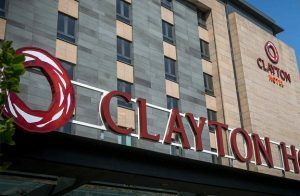 Ideally located right in the heart of Belfast City Centre and only a few minutes walk away from all the local tourist attractions, local pubs and restaurants. The perfect location for exploring Belfast City. 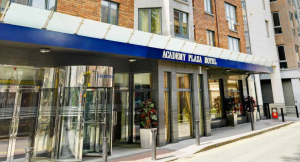 Academy Plaza Hotel is one of the most ideally located in Dublin city centre. It is just a short stroll to Temple Bar, Croke park stadium, Dublin Convention Centre, Trinity College, St Stephen’s Green and many other famous landmarks, city sights and attractions. This three-star hotel has a modern, luxurious feel to it from the minute you step through the doors into the magnificent marbled lobby. 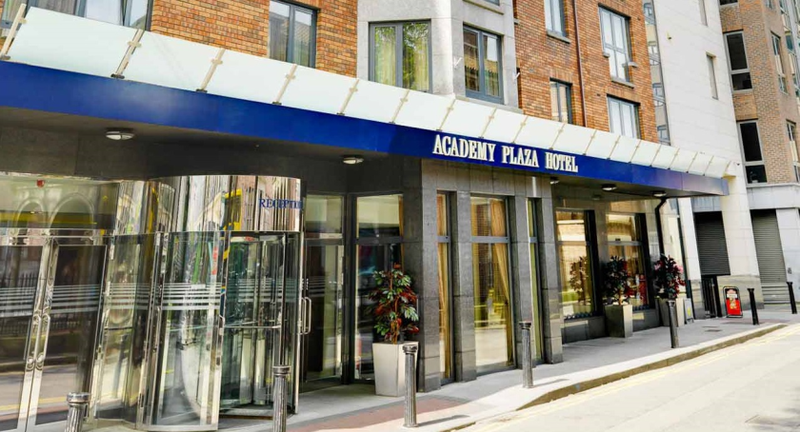 Academy Plaza is a family owned hotel and offers a real sense of Irish tradition and hospitality. 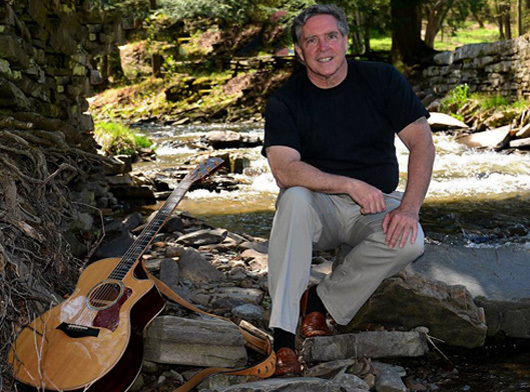 You bid farewell to the Emerald Isle as you board your flight back home. 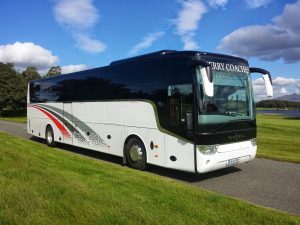 All our coaches are Luxurious and ideal for a comfortable tour of Ireland. There is ample leg room and all seats recline. The coaches are fully air conditioned and have a wc on board. There is a PA system on board so as not to miss a word of our knowledgeable and competent drivers/guides. Single Supplement $496.00 (Book early limited availability) – Based on single occupancy & to be paid along with Full Tour Cost. If you require post or pre travel arrangements to Ireland please note that this insurance price will not cover your additional costs. To receive a quote to cover all your travel arrangements please email info@bracktours.com and a member of the Brack Tours team will be in contact. To join this tour, complete the below registration form and send along with check deposit of $300 per person (and insurance fee if required) and make payable to Brack Tours or if paying by credit card please see the right hand section of this webpage for the tour booking form. Travel Protection is also payable at time of booking, if registering online a PayPal invoice will be emailed shortly after booking. Second Part Payment of $800 per person due by 1st April 2019 if you have registered online this will be payable via a PayPal Invoice. To find out about information on our Travel protection plans please click here. Do you require a Single Room Supplement? Do you want to purchase Group Travel Protection? Please choose the correct travel protection product from the below options.